The Shroud of Turin , which many people believe was used to wrap Christ's body, bears detailed front and back images of a man who appears to have suffered whipping and crucifixion. It was first displayed at Lirey in France in the 1350s and subsequently passed into the hands of the Dukes of Savoy. After many journeys the shroud was finally brought to Turin in 1578 where, in 1694, it was placed in the royal chapel of Turin Cathedral in a specially designed shrine. Photography of the shroud by Secondo Pia in 1898 indicated that the image resembled a photographic 'negative' and represents the first modern study. Subsequently the shroud was made available for scientific examination, first in 1969 and 1973 by a committee appointed by Cardinal Michele Pellegrino 1 and then again in 1978 by the Shroud of Turin Research Project (STURP)2. Even for the first investigation, there was a possibility of using radiocarbon dating to determine the age of the linen from which the shroud was woven. The size of the sample then required, however, was ~500cm, which would clearly have resulted in an unacceptable amount of damage, and it was not until the development in the 1970s of small gas-counters and accelerator-mass-spectrometry techniques (AMS), requiring samples of only a few square centimetres, that radiocarbon dating of the shroud became a real possibility. To confirm the feasibility of dating the shroud by these methods an intercomparison, involving four AMS and two small gas-counter radiocarbon laboratories and the dating of three known-age textile samples, was coordinated by the British Museum in 1983. The results of this intercomparison are reported and discussed by Burleigh et al.3. Following this intercomparison, a meeting was held in Turin in September-October 1986 at which seven radiocarbon laboratories (five AMS and two small gas-counter) recommended a protocol for dating the shroud. In October 1987, the offers from three AMS laboratories (Arizona, Oxford and Zurich) were selected by the Archbishop of Turin, Pontifical Custodian of the shroud, acting on instructions from the Holy See, owner of the shroud. At the same time, the British Museum was invited to help in the certification of the samples provided and in the statistical analysis of the results. The procedures for taking the samples and treating the results were discussed by representatives of the three chosen laboratories at a meeting at the British Museum in January 1988 and their recommendations 4 were subsequently approved by the Archbishop of Turin. in yr BP (years before 1950). The age of the shroud is obtained as AD 1260-1390, with at least 95% confidence. The sampling of the shroud took place in the Sacristy at Turin Cathedral on the morning of 21 April 1988. Among those present when the sample as cut from the shroud were Cardinal Anastasio Ballestrero (Archbishop of Turin), Professor L. Gonella (Department of Physics, Turin Polytechnic and the Archbishop's scientific adviser), two textile experts (Professor F. Testore of Department of Materials Science, Turin Polytechnic and G. Vial of Musée des Tissues and Centre International d'Étude des Textiles Anciens in Lyon), Dr M. S. Tite of the British Museum, representatives of the three radiocarbon-dating laboratories (Professor P. E. Damon, Professor D. J. Donahue, Professor E. T. Hall, Dr R. E. M. Hedges and Professor W. Woelfli) and G. Riggi, who removed the sample from the shroud. The shroud was separated from the backing cloth along its bottom left-hand edge and a strip (~10 mm x 70 mm) was cut from just above the place where a sample was previously removed in 1973 for examination. The strip came from a single site on the main body of the shroud away from any patches or charred areas. Three samples, each ~50 mg in weight, were prepared from this strip. The samples were then taken to the adjacent Sala Capitolare where they were wrapped in aluminium foil and subsequently sealed inside numbered stainless-steel containers by the Archbishop of Turin and Dr Tite. Samples weighing 50 mg from two of the three controls were similarly packaged. The three containers containing the shroud (to be referred to as sample 1) and two control samples (samples 2 and 3) were then handed to representatives of each of the three laboratories together with a sample of the third control (sample 4), which was in the form of threads. All these operations, except for the wrapping of the samples in foil and their placing in containers, were fully documented by video film and photography. The laboratories were not told which container held the shroud sample. Because the distinctive three-to-one herringbone twill weave of the shroud could not be matched in the controls, however, it was possible for a laboratory to identify the shroud sample. If the samples had been unravelled or shredded rather than being given to the laboratories as whole pieces of cloth, then it would have been much more difficult, but not impossible, to distinguish the shroud sample from the controls. (With unravelled or shredded samples, pretreatment cleaning would have been more difficult and wasteful.) Because the shroud had been exposed to a wide range of potential sources of contamination and because of the uniqueness of the samples available, it was decided to abandon blind-test procedures in the interests of effective sample pretreatment. But the three laboratories undertook not to compare results until after they had been transmitted to the British Museum. Also, at two laboratories (Oxford and Zurich), after combustion to gas, the samples were recoded so that the staff making the measurements did not know the identity of the samples. The three control samples, the approximate ages of which were made known to the laboratories, are listed below. Two were in the form of whole pieces of cloth (samples 2 and 3) and one was in the form of threads (sample 4). Sample 2. Linen (sample QI.T/32) from a tomb excavated at Qasr Ibrîm in Nubia by Professor J. M. Plumley for the Egypt Exploration Society in 1964. On the basis of the Islamic embroidered pattern and Christian ink inscription, this linen could be dated to the eleventh to twelfth centuries AD. Sample 3. Linen from the collection of the Department of Egyptian Antiquities at the British Museum, associated with an early second century AD mummy of Cleopatra from Thebes (EA6707). This linen was dated in the British Museum Research Laboratory using liquid scintillation counting, giving a radiocarbon age of 2,010 ± 80 yr BP (BM-2558). This corresponds to a calendar age, rounded to the nearest 5 years, of 110 cal BC - AD 75 cal at the 68 per cent confidence level 5 (where cal denotes calibrated radiocarbon dates). Sample 4. Threads removed from the cope of St Louis d'Anjou which is held in a chapel in the Basilica of Saint-Maximin, Var, France. On the basis of the stylistic details and the historical evidence the cope could be dated at ~ AD 1290 - 1310 (reign of King Phillipe IV). Because it was not known to what degree dirt, smoke or other contaminants might affect the linen samples, all three laboratories subdivided the samples, and subjected the pieces to several different mechanical and chemical cleaning procedures. All laboratories examined the textile samples microscopically to identify and remove any foreign material. The Oxford group cleaned the samples using a vacuum pipette, followed by cleaning in petroleum ether (40° C for 1 h) to remove lipids and candlewax, for example. Zurich precleaned the sample in an ultrasonic bath. After these initial cleaning procedures, each laboratory split the samples for further treatment. The Arizona group split each sample into four subsamples. One pair of subsamples from each textile was treated with dilute HCL, dilute NaOH and again in acid, with rinsing in between (method a). The second pair of subsamples was treated with a commercial detergent (1.5% SDS), distilled water, 0.1% HCL and another detergent (1.5% triton X-100); they were then submitted to a Soxhlet extraction with ethanol for 60 min and washed with distilled water at 70° C in an ultrasonic bath (method b). The Oxford group divided the precleaned sample into three. Each subsample was treated with 1M HCL (80° C for 2h), 1M NaOH (80° C for 2 h) and again in acid, with rinsing in between. Two of the three samples were then bleached in NaOCL (2.5% at pH-3 for 30 min). The Zurich group first split each ultrasonically cleaned sample in half, with the treatment of the second set of samples being deferred until the radiocarbon measurements on the first set had been completed. The first set of samples was further subdivided into three portions. One-third received no further treatment, one-third was submitted to a weak treatment with 0.5% HCL (room temperature), 0.25% NaOH (room temperature) and again in acid, with rinsing in between. The final third was given a strong treatment, using the same procedure except that hot (80° C) 5% HCL and 2.5% NaOH were used. After the first set of measurements revealed no evidence of contamination, the second set was split into two portions, to which the weak and strong chemical treatments were applied. All of the groups combusted the cleaned textile subsample with copper oxide in sealed tubes, then converted the resulting CO2 to graphite targets. Arizona and Oxford converted CO2 to CO in the presence of zinc, followed by iron-catalysed reduction to graphite, as described in Slota et al. 6. Zurich used cobalt-catalysed reduction in the presence hydrogen, as described by Vogel et al. 7,8. Each laboratory measured the graphite targets made from the textile samples, together with appropriate standards and blanks, as a group (a run). Each laboratory performed between three and five independent measurements for each textile sample which were carried out over a time period of about one month. The results of these independent measurements (Table 1) in each case represent the average of several replicate measurements made during each run (samples are measured sequentially, the sequence being repeated several times). The specific measurement procedures for each laboratory are given by Linick et al. 9 for Arizona, by Gillespie et al. 10 for Oxford and by Suter et al. 11 for Zurich. Arizona and Oxford measured 14C/13C ratios by AMS and determined the 13C/12C ratios using conventional mass spectrometry. Zurich determined both 14C/12C and 13C/12C quasi-simultaneously using AMS only. The conventional radiocarbon ages were all calculated using the procedures suggested by Stuiver and Polach12, with normalization to Ó13C = -25 0/00, and were accordingly reported in yr BP (years before 1950). The errors, which are quoted in Table 1 at the 1sd level ( sd is standard deviation), include the statistical (counting) error, the scatter of results for standards and blanks, and the uncertainty in the Ó13C determination (Arizona includes the Ó13C error at a later stage, when combining subsample results; Oxford errors below 40 yr are rounded up to 40). In years BP, corrected for Ó13C fractionation; errors at 1 sd level; see text for pretreatment details. On completion of their measurements, the laboratories forwarded their results to the British Museum Research Laboratory for statistical analysis. The individual results as supplied by the laboratories are given in Table 1. Each date represents a unique combination of pretreatment and measurement run and applies to a separate subsample, except where indicated by the identification code. From these data it can be seen that, for each laboratory, there are no significant differences between the results obtained with the different cleaning procedures that each used. Dates are in yr BP. d.f., degrees of freedom. * Standard errors based on scatter. ** Standard errors based on combined quoted errors. *** The probability of obtaining, by chance, a scatter among the three dates as high as that observed, under the assumption that the quoted errors reflect all sources of random variation. The mean radiocarbon dates and associated uncertainties for the four samples, as supplied by each of the three laboratories, are listed in Table 2 and shown in Fig.1. Also included in Table 2 are the overall unweighted and weighted means, the weights being proportional to the inverse squared errors as quoted by the laboratories. The underlying principle of the statistical analysis has been to assume that, unless there is strong evidence otherwise, the quoted errors fully reflect all sources of error and that weighted means are therefore appropriate. An initial inspection of Table 2 shows that the agreement among the three laboratories for samples 2, 3 and 4 is exceptionally good. The spread of the measurements for sample 1 is somewhat greater than would be expected from the errors quoted. More quantitatively, to establish whether the scatter among the three laboratory means was consistent with their quoted errors, a X2 test was applied to the dates for each sample, in accordance with the recommended procedure of Ward and Wilson 13. The results of this test, given in Table 2, show that it is unlikely that the errors quoted by the laboratories for sample 1 fully reflect the overall scatter. The errors might still reflect the uncertainties in the three dates relative to one another, but in the absence of direct evidence on this, it was decided to give the three dates for sample 1 equal weight in determining the final mean, and to estimate the uncertainty in that mean from the scatter of results. As shown in Table 2, the unweighted mean of the radiocarbon age of sample 1 and its uncertainty are 691 ± 31 yr BP. The confidence limits for sample 1 were obtained by multiplying the uncertainty by td, the value of a Student's t distribution with d degrees of freedom at the appropriate probability level. The value of d, which lies between the inter- and intra-laboratory degrees of freedom -- that is, between 2 and 9 -- was estimated at 5 on the basis of an analysis of variance on the 12 individual measurements supplied by the laboratories 14. Individual measurements from a particular laboratory were weighted according to their inverse squared errors, but the contributions from different laboratories were weighted equally, thus ensuring consistency with Table 2. Thus for sample 1, where the error has been estimated from the scatter, ~68% and 95% confidence limits for the true radiocarbon date were found from the 1.1 sd and 2.6 sd errors about the unweighted mean respectively, the multiplying factors being obtained from standard tables of the t5 distribution. However, for samples 2, 3, and 4, the limits were obtained in the usual way from 1 sd and 2 sd quoted errors about the weighted means, assuming normality. 'intercept' method. (See also Table 3.) Calibration is necessary because of natural variations in atmospheric14C. The calibration curve for the relevant period is that of Stuiver and Pearson 5, a portion of which is illustrated. confidence limits on the radiocarbon scale; the error envelope on the curve has therefore been omitted from the diagram. The stippled areas show how the 95% confidence limits are transformed from the radiocarbon to the calendar scale. The calendar-age ranges which correspond to the radiocarbon confidence limits are show in Table 3. These were determined from the high-precision curve of Stuiver and Pearson 5 based on dendrochronological dating. Method A (the intercept method) in revision 2.0 of the University of Washington Quaternay Isotope Laboratory Radiocarbon Calibration Program 15 was used. In this method, the error in the calibration curve is first incorporated into the radiocarbon error, thus widening the limits on the radiocarbon scale slightly; calendar ages are then found that correspond to these limits, without transforming the complete probability distribution of radiocarbon dates. No additional uncertainty has been added to take account of the short growth period of textile samples. There is little published guidance on this, although it has been suggested that 15 years should be added in quadrature to the overall uncertainty in the radiocarbon date for samples of growth period less than one year, such as linen. In general, such additional uncertainty would widen the 95% calendar limits by ~ 2 - 4 years at either end, except for sample 3 where the 9 cal BC limit would be changed to 34 cal BC. The 95% limits for the shroud are also illustrated in Fig. 2, where it is apparent that the calibration of the radiocarbon date for sample 1 gives a double range. The correct transformation of probability distributions from the radiocarbon to the calendar scale is still subject to debate, there being two different methods of dealing with multiple intercepts. However, both methods agree that the major probability peak lies in the earlier of the two ranges, in the 68% range at the end of the thirteenth century. Sample 4 has a very narrow calendar range: this is due to the steep slope in the calibration curve at this point, and is an occasional instance of calibration reducing rather than increasing a confidence range. 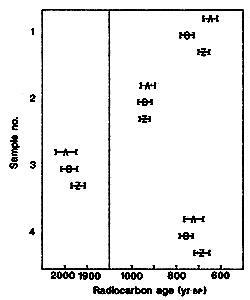 Sample 3 compares well with the date obtained by conventional radiocarbon dating; there is no evidence for a difference between the two results. The dates for samples 2 and 4 agree with the historical evidence, which places them in the eleventh to twelfth centuries and late thirteenth/early fourteenth centuries AD respectively. The results, together with the statistical assessment of the data prepared in the British Museum, were forwarded to Professor Bray of the Istituto di Metrologia 'G. Colonetti', Turin, for his comments. He confirmed that the results of the three laboratories were mutually compatible, and that, on the evidence submitted, none of the mean results was questionable. * Confidence limits on the radiocarbon scale found from the standard error on the unweighted mean, assuming a t5 distribution (multiplying factors 1.1 and 2.6 for 68% and 95% respectively). Standard error estimated from scatter. ** Confidence limits on the radiocarbon scale found from the standard error on the weighted mean, assuming a normal distribution (multiplying factors 1 and 2 for 68% and 95% limits respectively). Standard error computed from quoted errors. *** Date by convential radiocarbon dating at the British Museum: 2010 ± 80 yr. BP (MB - 2558). The results of radiocarbon measurements at Arizona, Oxford and Zurich yield a calibrated calendar age range with at least 95% confidence for the linen of the Shroud of Turin of AD 1260 - 1390 (rounded down/up to nearest 10 yr). These results therefore provide conclusive evidence that the linen of the Shroud of Turin is mediaeval. The results of radiocarbon measurements from the three laboratories on four textile samples, a total of twelve data sets, show that none of the measurements differs from its appropriate mean value by more than two standard deviations. The results for the three control samples agree well with previous radiocarbon measurements and/or historical dates. We thank Cardinal Anastasio Ballestrero for allowing us access to the shroud, Professor L. Gonella for his help and support throughout the project and Professor A. Bray for commenting on our statistical assessment of the data. We also thank Miss E. Crowfoot, T. G. H. James, Dr J. Evin, M. Prevost-Macillacy, G. Vial, the Mayor of Saint-Maximin and the Egypt Exploration Society for assistance in obtaining the three known-age control samples. Oxford thank P. H. South (Precision Process (Textiles) Ltd, Derby) for examining and identifying the cotton found on the shroud sample; R. L. Otlet (Isotopes Measurement Laboratory, AERE, Harwell) for stable isotope ratio measurements on two samples; J. Henderson and the Department of Geology, Oxford Polytechnic for undertaking scanning electron microscopy, and SERC for the Special Research Grant which provided the primary support for the Radiocarbon Accelerator Unit. Zurich thank the Paul Scherrer Institut (PSI, CH-5234 Villigen) for technical and financial support. The AMS Programme at Arizona is partially supported by a grant from the NSF. La S. Sindone-Ricerche e studi della Commissione di Esperti nominata dall' Arcivescovo di Torino, Cardinal Michele Pellegrino, nel 1969 Supplemento Rivista Diocesana Torinese (1976). Jumper, E.J. et al. in Archaeological Chemistry-III (ed. Lambert, J. B.) 447-476 (Am. chem. Soc., Washington, 1984). Burleigh, R., Leese, M. N. & Tite, M.S. 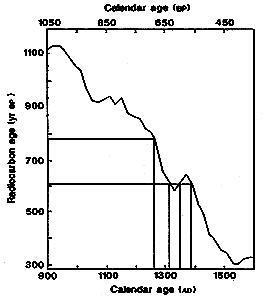 Radiocarbon 28, 571-577 (1986). Stuiver, M. & Pearson, G.W. Radiocarbon 28, 805-838 (1986). Slota, P.J., Jull, A. J. T., Linick, T. W. & Toolin, L. J. Radiocarbon 29, 303-306 (1987). Vogel, J. S., Nelson, D.E. & Southon, J.R. Radiocarbon 29, 323-333 (1987). Vogel, J. S., Southon, J.R. & Nelson, D.E. Nucl. Instrum. Meth. B29, 50-56 (1987). Linick, T. W., Jull, A. J. T., Toolin, L. J. & Donahue, D. J. Radiocarbon 28, 522-533 (1986). Gillespie, R., Gowlett, J. A. J., Hall, E. T. & Hedges, R. E. M. Archaeometry 26, 15-20 (1984). Suter, M. et. al. Nucl. Instrum. Meth. 233[B5], 117-122 (1984). Stuiver, M. & Polach, H. A. Radiocarbon 19, 355-363 (1977). Ward, G. K. & Wilson, S. R. Archaeometry 20, 19-31 (1978). Caulcott, R. & Boddy, R. Statistics for Analytical Chemists (Chapman and Hall, London, 1983). Stuiver, M. & Reimer, P. J. Radiocarbon 28, 1022-1030 (1986).